So I wanted to ask: What does your Minecraft skins look like? Need I say more about my skin? where do you think my avatar came from? 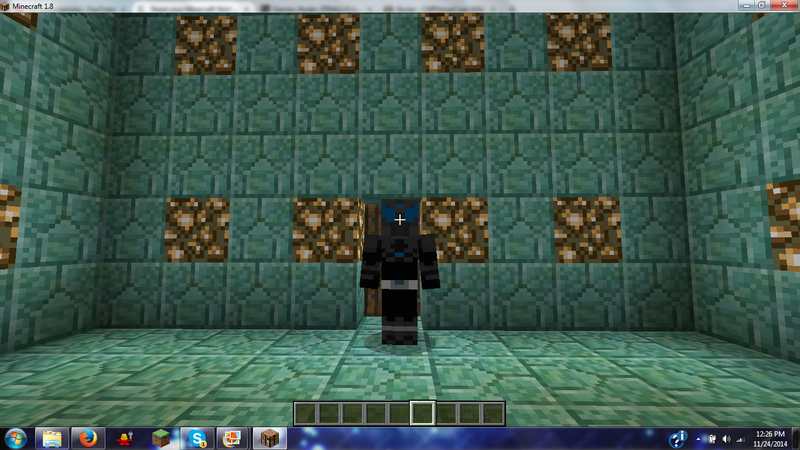 This is currently mine, standing in front of a huge Axonn Axe. I've gone through a few of them. The second was Kamen Rider Baron in his Banana arms. I ditched this one because I couldn't get proper horns with the square restrictions of MC. The last one I had was Kamen Rider Knight in his Survive Armor. And the most current is Kamen Rider Nyran himself. A fan made character finally brought to life, at least in MC Skin form. Yes, I know about the Minecraft screenshot thing, this was just easier for me so bleh. I can't find the exact skin. Mine is simple... and temporary. Mine is Anthony from both Crystal Bonds and Infinity. I originally went on the internet by the alias of MCenderdude. Took me a while to re-find this skin on my old computer. Thank goodness for flash drives. I usually just use Biocraft Tahu or Pohatu as my skin.